Edit design Knit sweater spain , or create your design from scratch. Knit sweater spain for women and men. This football knitwear in yellow and red is not only for the world cup 2018, but for the fans and players. 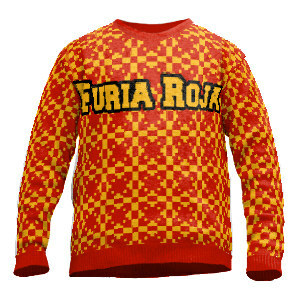 Be creative and design your sweater for "La Furia Roja", the red fury. Crew neck knitsweater sized S to XXL, made in the spanish national colors, with allover knit-in design. Design custom football sweaters and knitted soccer jumpers online and order directly from the knit manufacturer that your bespoke design from 1pc already.